Lock in a great price for Hotel The World – rated 8.6 by recent guests! A delicious breakfast and very close to my work place. Breakfast very good, with quality products and so many options. It was a very strong point. 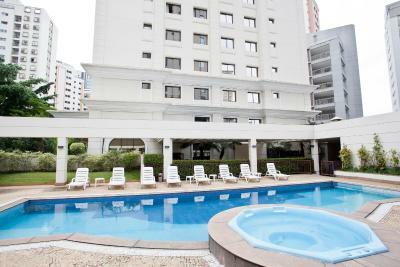 The hotel is very clean and the staff is kind and always able to help. 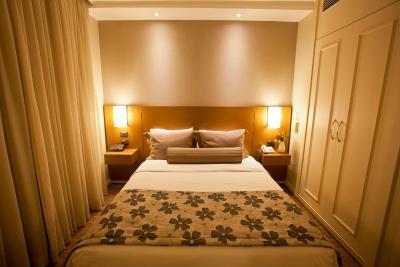 Bedroom is confortable and it has a smart distribuition, which leaves the space bigger than it really is. Around the property there are so many restaurants, pubs and many others entertaiment options, a shopping center near with cinema and theater, it's a very good option, too. I like the buffet breakfast! A great variety of hot and cold food for selection. I enjoy the time lying on the loungers around the pool. The staff is really friendly and helpful. My room is on 27th floor with the amazing view. Close to Vila Olímpia shopping mall. It only takes around 5-minute walk. Everything of the place is awesome, the pool, gym area, cleanliness, the room very comfortable and the staff is very good, all of them. 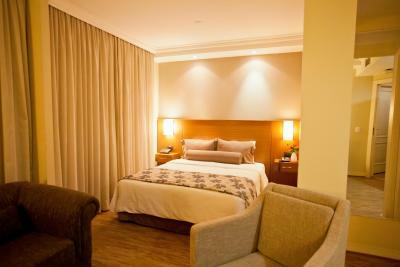 Great hotel in great location, room very spacious and comfortable bed. We only stayed one night, but the room had everything, a mini kitchen & a small living room. Very good size of the room and perfect location. Quarto com cama e ante-sala com sofá-cama ... acomoda bem 3 pessoas ... televisão, Ok, internet, Ok, mini-cozinha, ok, banheiro, ok para o tamanho e para o chuveiro. Café da manhã excelente e piscina muito boa! Quarto aconchegante, com cama e travesseiros bem confortáveis. Localização excelente, com vários restaurantes, bares e shopping próximos para quem buscar um pouco de lazer na região. Café da manhã excelente, bem diversificado e gostoso. Equipe bem educada e atenciosa. O café da manhã é bem preparado e com muitas opções. 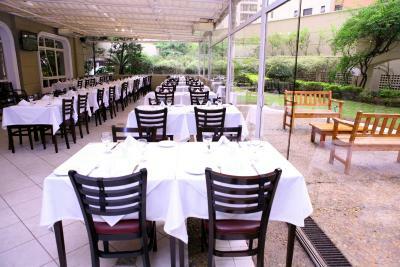 A localização 'emito bom com varias lojas, restaurantes e um shopping bem próximo. 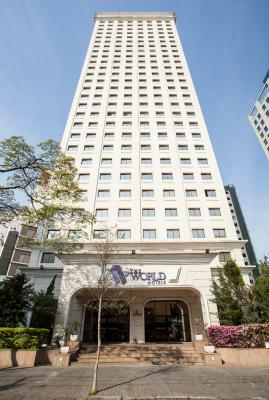 Hotel The World This rating is a reflection of how the property compares to the industry standard when it comes to price, facilities and services available. It's based on a self-evaluation by the property. Use this rating to help choose your stay! One of our top picks in São Paulo.The World is near trendy clubs and restaurants in São Paulo's upscaled Vila Olímpia district. Only 5 minutes' drive from Berrini Financial Center, it features a pool, a gym and Wi-Fi access. Accommodations includes a flat-screen cable TV, complete kitchenette and mini-bar. Each room at The World is equipped with a living room as well. A radio and a telephone are also provided. 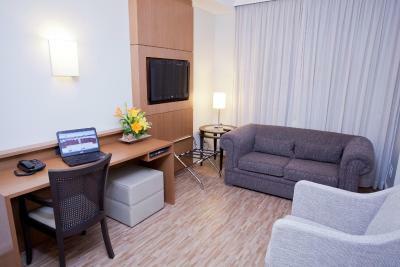 Facilities consist of a 24-hour desk and private parking. Guests can have a massage session or relax in the hot tub. A sauna unit is available too. Guests enjoy local beers and cocktails at the lobby bar. 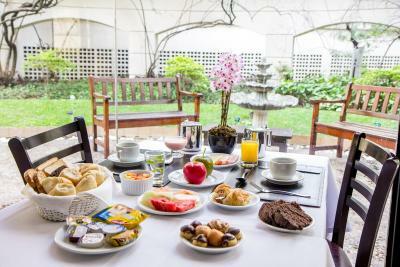 The spacious restaurant serves international cuisine and Brazilian food. 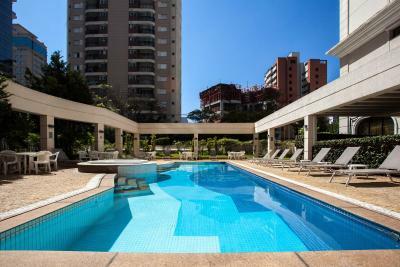 The World is located 3 blocks from Avenida dos Bandeirantes and Brigadeiro Faria Lima Avenue. 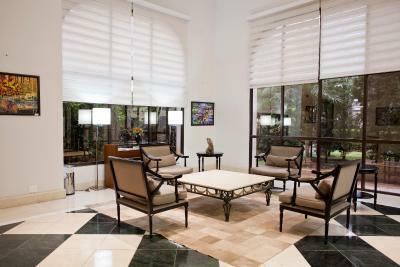 Free transfer in a 3.1 miles radius from the hotel is available on weekdays, from 7:00 to 19:00. Itaim Bibi is a great choice for travelers interested in gourmet food, restaurants and food. When would you like to stay at Hotel The World? This room is equipped with air conditioning, a flat-screen cable TV, a living area and a kitchenette with a mini-bar and a microwave. The private bathroom comes with a shower, a hairdryer and free toiletries. Extras include a desk and a safety deposit box, as well as a coffee and tea machine. Free WiFi is included. Private parking is available on site (reservation is not needed) and costs BRL 12 per day. 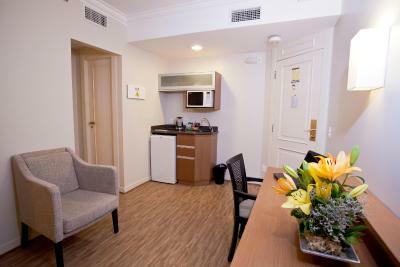 This double room has air conditioning, a flat-screen cable TV, a living area and a kitchenette with a mini-bar and a microwave. The private bathroom comes with a shower, a hairdryer and free special toiletries. 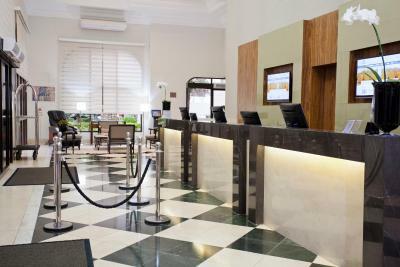 Extras include a desk and a safety deposit box, as well a coffee and tea machine and amenities such as fruits, chocolates and free ironing of one piece of clothing. Free WiFi and free parking are included. Early check in and late check out can be arranged upon request according to availability. Hotel surroundings – This neighborhood is a great choice for travelers interested in gourmet food, restaurants and food – Check location Excellent location – show map Guests loved walking around the neighborhood! House Rules Hotel The World takes special requests – add in the next step! Hotel The World accepts these cards and reserves the right to temporarily hold an amount prior to arrival. Please note that the hotel will request a credit card pre authorization or advanced payment upon check in. Please note that bookings for double bed or two twin beds in accommodations for one person may undergo changes at check-in upon availability, but will be granted priority as required by the guests. Please inform Hotel The World of your expected arrival time in advance. You can use the Special Requests box when booking, or contact the property directly using the contact details in your confirmation. The breakfast could improve its repetitive, and not very good in quality. The room service is not good. Great Location, confortable beds and TV with SAP. The property is clean but quite old. No bar or ambiance. Key pass system to the rooms was broken and anyone could get into any floor, which wasn't very secure. Transporte era difícil, só táxi. Dos arredores tranquilos e silenciosos do hotel. The internet, it was a little slow and sometimes the conexion had some troubles, but any to disturbe our stay there. Maybe it was a problem with the internet provider. If you need to go to the center of the city, the property is a little far away, but it's possible to take a Metropolitan Train - the station is about 10-15 min. by walking. And there are so many facilities to take any other transportation form around - taxi, bus, Uber, etc. The pool water is freezing !!!!!!!!!!!! (Anyway, personally I like swimming a lot so I still went swimming. The pool is big and clean) The facility in gym is really old. Check in e check out super demorados. overall the location of the hotel is not good for who is traveling on holidays. other sao Paulo areas are great.